Indoor Autumn Nature in New Jersey. 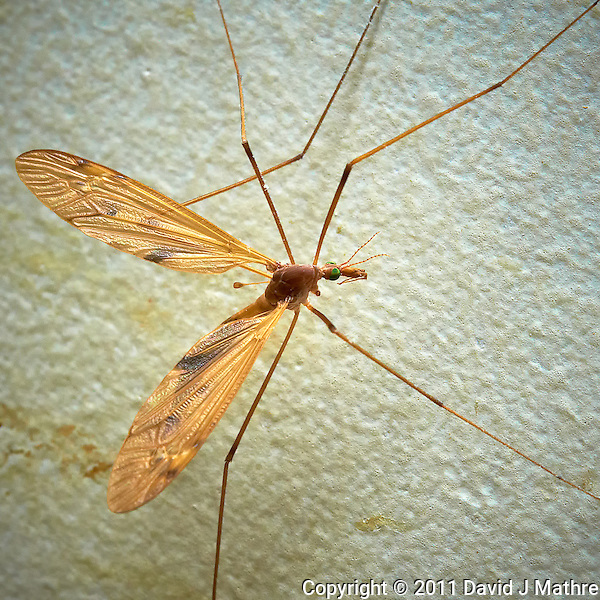 Indoor Crane Fly. A macro image of a Crane Fly. It looks like an over sized mosquito, but does not bite. It has a hard time flying, and its legs seem to be double jointed. This Crane Fly is missing its right front leg. The green compound eyes are interesting. I guess that this one got in while I was trying to do some night sky photography. The sky has actually been clear for two days straight. For this Crane Fly image, I used my Nikon D300 camera since the other camera bodies were outside for the night sky project. Backyard Autumn Nighttime Sky Over New Jersey. 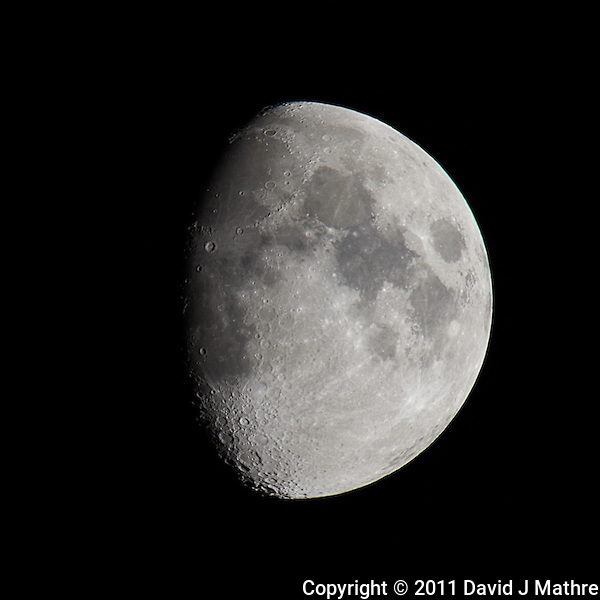 With a clear sky, and bright waxing gibbous moon I experimented ways to acquire sharp images of the moon through a 600 mm f/4 VR telephoto lens. The lens is mounted on a tripod with a Wimberley gimble tripod head. VR is turned off, and the camera set for “mirror up” mode. I used a remote release, and let the system stabilize for 30 seconds (time-out for mirror up) before the shutter would be triggered. The first five images are #1 (f/16, 1/50 sec); #2 (f/11, 1/100 sec); #3 (f/8, 1/200 sec); #4 (f/5.6, 1/400 sec); and #5 (f/4, 1/800 sec). I think the best was #4 (f/5.6, 1/400 sec), although all were pretty good. The next two images used a TC-E III 20 teleconverter for an effective focal length of 1200 mm #6 (f/16, 1/50 sec); #7 (f/11, 1/100 sec). Here I think #7 (f/11, 1/100 sec) is best. 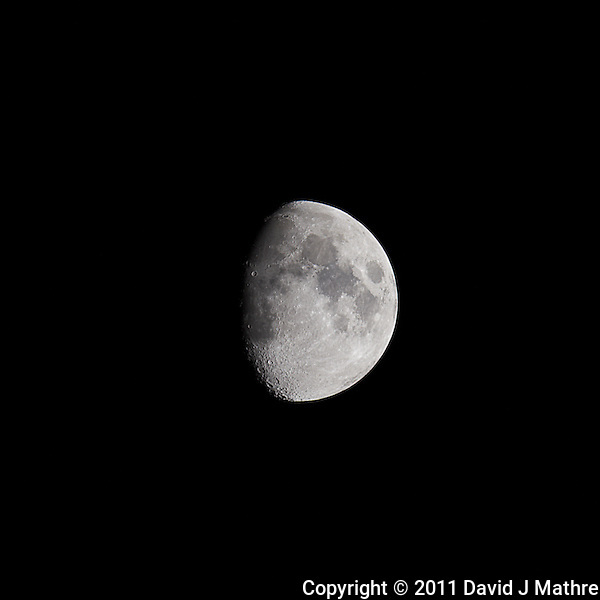 With the additional magnification, a faster shutter speed is needed to counteract the motion of the moon. I also made several DSLR videos of the moon, since I was using my Nikon D3s camera body. When I reviewed the videos, I saw that I had captured at least two satellite transits in front of the moon. These transits are less than 1 second long. Subject for another post.